 using or repairing electric or hybrid vehicles. Batteries are used to store electrical energy. Many of the things we use every day rely on the instant power provided by batteries. However, the larger batteries found in workplaces can be dangerous and may explode if used incorrectly. Injuries from batteries include serious chemical burns to the face, eyes and hands, and wounds from flying pieces of metal and plastic. Burns from metal objects that have become very hot or have exploded after short-circuiting the battery’s terminals occur frequently. Serious electric shocks and burns are common in accidents involving high-voltage battery packs. There are two main classes of battery: those that can be recharged and those that cannot. This page gives advice about how to reduce the risks of using rechargeable batteries. The two most important types of rechargeable battery are lead/acid and alkaline. Lead/acid batteries are the most common large-capacity rechargeable batteries. There is one in almost every car, motorcycle and wagon on the road. They are often used in electric vehicles, such as fork-lift trucks, and in the UPS of computer/communication, process and machinery control systems. Alkaline rechargeable batteries, such as nickel-cadmium, nickel-metal hydride and lithium ion, are widely used in small items such as laptop computers. Large-capacity versions of these cells are now used in transport and UPS applications. There are two different types of lead/acid and alkaline rechargeable batteries: valve-regulated (‘maintenance-free’) and vented. In valve-regulated batteries, any hydrogen and oxygen produced during charging does not escape but is converted back into water. You cannot add water to these batteries, as they do not need topping up. In contrast, vented batteries allow any hydrogen and oxygen produced to escape into the surrounding atmosphere. They require regular topping up with water. The lead, nickel, lithium or cadmium compounds often found in batteries are harmful to humans and animals. These chemicals can also seriously damage the environment. Hydrogen and oxygen are usually produced inside a battery when it is being charged. A source of ignition – for example, a flame, a spark, a cigarette or any hot object, electrical equipment, a mobile phone – will often cause mixtures of these gases to ignite and explode. The explosion is often so violent that it shatters the battery and produces a highly dangerous shower of fragments and corrosive chemicals. Hydrogen and oxygen are produced more quickly as the battery gets close to being fully charged. If you continue charging after the battery is fully charged, a lot of gas will be produced, greatly increasing the risk from explosion. poorly ventilated battery room), a violent explosion is likely. Batteries contain a lot of stored energy. Under certain circumstances this energy may be released very quickly and unexpectedly. This can happen when the terminals are short-circuited, for example with an uninsulated metal spanner or screwdriver. When this happens, a large amount of electricity flows through the metal object, making it very hot very quickly. If it explodes, the resulting shower of molten metal can cause serious burns and ignite any explosive gases present around the battery. The sparks can give out enough ultra-violet (UV) light to damage the eyes. Ensure that live conductors are effectively insulated or protected.  Display suitable notices/labels warning of the danger.  Control access to areas where dangerous voltages are present. The charging of lead-acid batteries can be hazardous. However, many workers may not see it that way since it is such a common activity in many workplaces. The two primary risks are from hydrogen gas formed when the battery is being charged and the sulfuric acid in the battery fluid. For general safety precautions when working with batteries, please see the OSH Answers Garages - Batteries which covers automotive vehicle sized batteries. For specific guidelines regarding large industrial batteries, check with the manufacturer for recommended safe work procedures. When batteries are being recharged, they generate hydrogen gas that is explosive in certain concentrations in air (explosive limits are 4.1 to 72 percent hydrogen in air). The ventilation system can exchange an adequate amount of fresh air for the number of batteries being charged. This is essential to prevent an explosion. Also, no flame, burning cigarette, or other source of ignition should be permitted in the area. You can get a skin burn when handling lead-acid batteries. Sulfuric acid is the acid used in lead-acid batteries and it is corrosive. If a worker comes in contact with sulfuric acid when pouring it or when handling a leaky battery, it can burn and destroy the skin. It is corrosive to all other body tissues. For example, the eyes, respiratory tract, or digestive system can be harmed severely if a worker gets a splash in the eyes, inhales sulfuric acid mist or accidentally ingests sulfuric acid. As with any corrosive chemical, proper handling procedures must be followed to prevent contact with the liquid. This includes the wearing of gloves, face and eye protection, and aprons that are suitable for protecting you from accidental contact with sulfuric acid. As well, adequate first aid facilities, eye wash stations and emergency showers are necessary to reduce the severity of accidental contacts. If contact with acid occurs, flush the area (eyes, skin) immediately for at least 30 minutes with clean, lukewarm, gently flowing water. Get medical help. Depending on the metal alloy composition in lead-acid batteries, a battery being charged can generate two highly toxic by-products. One is arsine (arsenic hydride, AsH3) and the other is stibine (antimony hydride, SbH3). Generally, the air levels of these metal hydride tend to remain well below the current occupational exposure limits during battery charging operations. However, their possible presence re-enforces the need for adequate ventilation systems. How should industrial size batteries be handled? Industrial batteries (e.g., forklifts or battery powered industrial trucks) may weigh up to 900 kg (2,000 lbs) or more. Batteries must be securely placed and restrained. Use only the appropriate tools and follow safe work procedures. Why can you get a burn from acid when handling the batteries? Raise the lid or open the doors of the battery compartment before starting tocharge the battery. This will help to prevent an explosive mixture of gases building up. Before starting to charge a vented battery, check that the electrolyte level is justabove the tops of the plates in all the cells. Top up the cells with distilled or deionised water if the level is too low. Make sure the charger is switched off before connecting the charging leads to the battery (unless the charger manufacturer specifies a different procedure). Connect the charger’s positive (+) lead to the battery’s positive terminal and the negative (-) lead to the negative terminal.  Check that the charging leads are securely clamped in position before switching on the charger. Never charge the battery faster than the battery manufacturer’s specified maximum charging rate. Do not remove or adjust the charging leads while the charger is switched on. Always switch it off first. Switch off the charger before disconnecting the charging leads from the battery (unless the manufacturer’s instructions specify otherwise). Allow a vented battery to stand for at least 20 minutes after disconnecting it from the charger. Carefully top up the electrolyte with distilled or deionised water to the manufacturer’s recommended level. Store the charging leads so that the uninsulated parts do not rest against each other or any earthed metalwork. This will prevent short circuiting if the charger is switched on suddenly. Important to know about batteries? 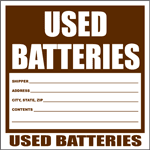 Lead-acid batteries contain sulfuric acid and only trained and authorized personnel should handle them. When talking about lead-acid batteries, people usually call sulfuric acid "battery acid" or the "electrolyte". An electrolyte is general term used to describe a non-metallic substance like acids such as sulfuric acid or salts that can conduct electricity when dissolved in water. Use extreme care to avoid spilling or splashing the sulfuric acid solution. It can destroy clothing and burn the eyes and skin. Always wear splash-proof goggles and protective clothing (gloves and aprons). A face shield (with safety goggles) may also be necessary. Batteries can weigh about 14 to 27 kg (30 to 60 lb) so practice safe lifting and carrying procedures to prevent back injuries. Use a battery carrier to lift a battery, or place hands at opposite corners. Only work with or charge batteries if you have been trained to do so. First aid for splash some battery acid in my eyes or skin? Use an emergency eyewash/shower station if solution is splashed into the eyes. Immediately flush the contaminated eye(s) with clean, lukewarm, gently flowing water for at least 30 minutes, by the clock, while holding the eyelid(s) open. If irritation persists, repeat flushing. Neutral saline solution may be used as soon as it is available. DO NOT INTERRUPT FLUSHING. If necessary, keep the emergency vehicle waiting. Take care not to rinse contaminated water into the unaffected eye or onto the face. First aiders should avoid direct contact. Wear chemical protective gloves, if necessary. Quickly transport the victim to an emergency care facility. As quickly as possible, flush the contaminated area with lukewarm, gently flowing water for at least 30 minutes, by the clock. If irritation persists, repeat flushing. DO NOT INTERRUPT FLUSHING. If necessary, keep emergency vehicle waiting. Under running water, remove contaminated clothing, shoes and leather goods (e.g., watchbands, belts). Discard contaminated clothing, shoes and leather goods. Transport the victim to an emergency care facility immediately. Charge batteries in a designated, well-ventilated area. Do not attempt to recharge a frozen or damaged battery. Follow the manufacturer's recommendations for charging rates, connections and vent plug adjustment. Properly maintained vent caps will reduce the chance of electrolyte spray. Unplug or turn the charger off before attaching or removing the clamp connections. Carefully attach the clamps in proper polarity to the battery. Rinse off batteries and clean terminals before recharging. Fill sulfuric acid (electrolyte) to the prescribed level before charging to reduce the possibility of the electrolyte heating up excessively. If water is added, use distilled water, not tap water. Turn off the charger before disconnecting the cables from the battery. Keep metal tools and other metallic objects away from batteries. Inspect for defective cables, loose connections, corrosion, cracked cases or covers, loose hold-downs and deformed or loose terminal posts. Replace worn or unserviceable parts. Tighten cable clamp nuts with the proper size wrench. Avoid subjecting battery terminals to excessive twisting forces. Use a cable puller to remove a cable clamp from the battery terminal. Remove corrosion on the terminal posts, hold-down tray and hold-down parts. Use a tapered brush to clean dirt from the battery terminals and the cable clamps. Use a battery carrier to lift a battery, or place hands at opposite corners. Do not lean over a battery. Tips for handling battery solutions? Pour concentrated acid slowly into water: Do NOT add water into acid - the water tends to sit on top of the heavier (more dense) acid. The water can become hot enough to spatter. Use nonmetallic containers and funnels. Recap any electrolyte container and store it in a safe place at floor level. Do not store acid in hot locations or in direct sunlight. Do not store electrolyte solution on shelves or any location where the container can overturn. Do not squeeze or puncture a container with a screwdriver or other instrument. The acid solution may splash on face, hands, or clothing. Do not fill a new battery with electrolyte solution while it is in the vehicle. Fill the battery while it is on the floor, before installation. The vehicle is NEGATIVELY grounded when the cable attached to the NEGATIVE post of the "dead" battery is also attached to the engine block. Clamp one end of the red cable onto the positive post of the "dead" battery. Clamp the other end of the red cable onto the positive post of the booster battery. Clamp one end of the black cable onto the negative post of the booster battery. Clamp the other end of the black cable onto the engine block below and away from the "dead" battery. Start the engine of the booster vehicle, then the engine of the "dead" vehicle. Remove the black negative clamp from the engine block of the vehicle with the "dead" battery. Remove the black negative clamp from the booster battery. Remove the red positive clamp from the booster battery. Remove the red positive clamp from the "dead" battery. The vehicle is POSITIVELY grounded when the cable attached to the POSITIVE post of the "dead" battery is also attached to the engine block. Clamp one end of the black cable onto the negative post of the "dead" battery. Clamp the other end of the black cable to the negative post of the booster battery. Clamp one end of the red cable onto the positive post of the booster battery. Clamp the other end of the red cable onto the engine block below and away from the "dead" battery. Remove the red positive clamp from the engine block of the vehicle with the "dead" battery. Remove the black negative clamp from the "dead" battery. This section gives detailed technical advice on how to reduce the risk from fire and explosion when batteries are charged. Once the maximum charging current is known, the rate at which hydrogen is released during charging can be calculated. With this information it is possible to determine the airflow needed to provide effective ventilation and avoid a flammable atmosphere forming in the charging area. This approach may enable all but the immediate vicinity of the battery to be identified as non-hazardous when a hazardous area classification is carried out. In most situations, a zone 1 hazardous area (flammable atmosphere likely to be present) should be considered to exist for up to one metre in all directions around batteries under charge. All equipment present within the hazardous zone should be suitable and should be constructed and maintained to an appropriate standard. Mixtures with air containing from 4% hydrogen (lower explosion limit – LEL) to 75% hydrogen (upper explosion limit – UEL) will readily ignite and explode. Consequently, providing effective ventilation is one way of preventing a flammable mixture of hydrogen and air/oxygen accumulating. The Dangerous Substances and Explosive Atmospheres Regulations 2002 (DSEAR) require that ‘adequate ventilation should maintain the average concentration of dangerous substances during normal operation to below that which could form an explosive atmosphere’.8 Sufficient ventilation should be provided to ensure that the concentration of hydrogen is diluted well below the LEL. The size of the ‘margin of safety’ provided by dilution ventilation should reflect the risk to people. In charging areas that people enter (workrooms) the concentration of hydrogen should not exceed 0.4% vol/vol (10% of the LEL). When charging takes place in an enclosure that people do not enter, the concentration of hydrogen should not exceed 1% vol/vol (25% of the LEL). Effective dilution depends on several factors. These include the rate of hydrogen production; the location of the battery within the area; the shape and size of the area; and anything that would impede the natural circulation of air. However, in relatively uncongested areas natural ventilation is often sufficient to provide effective dilution. The buoyancy of hydrogen causes it to rise from the battery and accumulate against ceilings or bulkheads. Consequently, charging areas and battery compartments or enclosures should be equipped with appropriate air vents, ie inlets at low level and outlets at high level. These should be located in two opposing exterior walls or in a door and an opposing exterior wall. If natural ventilation is insufficient to achieve the required level of ventilation, suitable mechanical means should be used. The ventilation air must be drawn from and discharged to a safe place. An alarm system should be installed to detect build-up of hydrogen or failure of mechanical ventilation and to isolate electrical equipment in the area. Wear gloves and suitable eye protection, preferably goggles or a visor.  Wear a plastic apron and suitable boots when handling battery chemicals such as sulphuric acid or potassium hydroxide.  Empty your pockets of any metal objects that could fall onto the battery or bridge across its terminals.  Keep sources of ignition – such as flames, sparks, electrical equipment, hot objects and mobile phones – well away from batteries that are being charged, have recently been charged, or are being moved.  Use suitable single-ended tools with insulated handles.  Fit temporary plastic covers over the battery terminals.  Charge batteries in a dedicated, well-ventilated area.  Share the load with a workmate when lifting batteries – they can be very heavy. clutter you could trip on.  Wash your hands thoroughly after working with batteries, especially before eating, smoking or going to the toilet. Work with batteries unless you have been properly trained.  Wear a watch, ring, chain, bracelet or any other metal item.  Overcharge the battery – stop charging as soon as it is fully charged.